At the moment this article is written the earth is travelling around the sun at a speed of 30 Kilometers per second. It is almost 70 times faster than the fastest bullet. But still you are not thrown out of the earth. It also rotates in its own axis at a speed of 465 meters per second but you cannot even feel this rotation and that is because of the gravity force. Gravity is the force that pulls things towards the center of the earth or towards the center of other physical bodies that have mass. The heavier the mass of an object is the stronger gravitational force it has. It is this simple but crucial law that underpins the harmony and order of the universe. It governs the motions of stars, planets and galaxies. Have you ever thought what will happen if the gravity force would stop? If that happens, you wouldn’t be able to walk on earth, your digestive system wouldn’t work, the plants wouldn’t grow anymore, the atmosphere would not encircle the earth and there would be no water cycle, the most of biological processes on earth would slow down or shortly the life would be impossible for you. Nothing would act normally in the entire universe and everything would go to a stage of disorder. 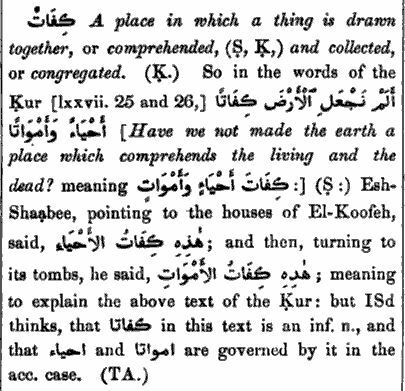 The key Arabic word (kifaatan) in the passage (Qur’an 77:25) describes gravity as a holding force exerted by the earth. The mentioning word also means to collect, to gather or to attract things toward one and this is what Newton described about gravity in his book called the ‘Mathematical Principles of Natural Philosophy’.